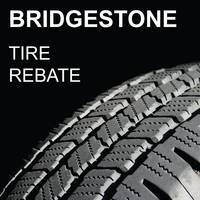 Bridgestone: Take Control With $70 Back by Mail! When you purchase a set of four (4) select Bridgestone tires, you may be eligible to receive a $70 Bridgestone Visa® Prepaid Card after mail-in rebate. Offer valid on tires purchased at an authorized dealer, and picked-up or installed between 12:00 a.m. EDT April 4, 2019 and 11:59 p.m. EDT May 6, 2019. Offer valid only in the 50 United States and the District of Columbia (includes APO/FPO addresses) while supplies last. The offer does not apply to Canadian residents. Void in PR and where prohibited. Must be 18 or over. See dealer for complete details.